Millions of people live in deserts around the world. They are called Desert Peoples. Their lifestyle is so different, as they have to live in harsh conditions in the desert. In this lesson, let’s talk about the daily life of desert peoples. Why we call them Desert peoples? The human beings of a particular nation or community or ethnic group are called peoples. So, such people live in deserts are called desert peoples. What do desert peoples do for their living? 1) Some people mine either copper or other materials in desert mines. 2) They also work on desert farms. 3) Shepherds (or nomads) in the Middle-East go from place to place looking for food and water for their animals. Where do desert peoples live in a desert? People who live in deserts usually live near a source of water. This is because to make their daily life easier. E.g. They live on the banks of rivers that flow through deserts or on oases. Since water is so important to life in the desert, it must be carefully used and also be carefully protected. So, people in the deserts in fact, know how to use less water in their day-to-day needs. Therefore, they are so careful in using as well as protecting water. Desert oases indeed, give life to the desert peoples. So do springs and waterholes. Thus, they support the life in deserts immensely. How do deserts lose most of the rainwater? It either runs off the hard, dry surface or evaporates into the air. A little amount of rainwater soaks to the ground where it may eventually join underground rivers and streams. However, in few places, water from these underground rivers or streams flows to the surface of the desert. 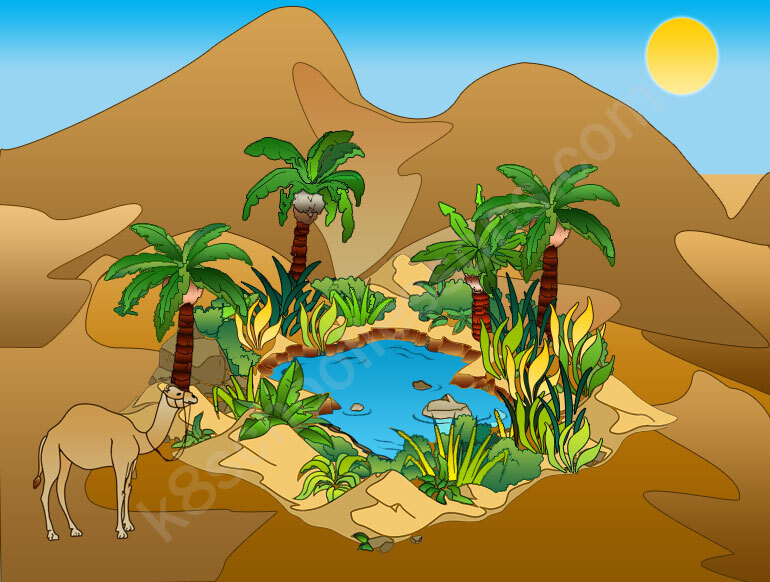 So, the water forms a spring or waterhole, making the land fertile. Hence, plants can grow. This is called an oasis. Also, a river flowing through a desert may have long oases along its banks. A place where water flows out of the ground is called a spring. So, now what’s a waterhole?? A pool of water from which animals drink regularly is called a waterhole. 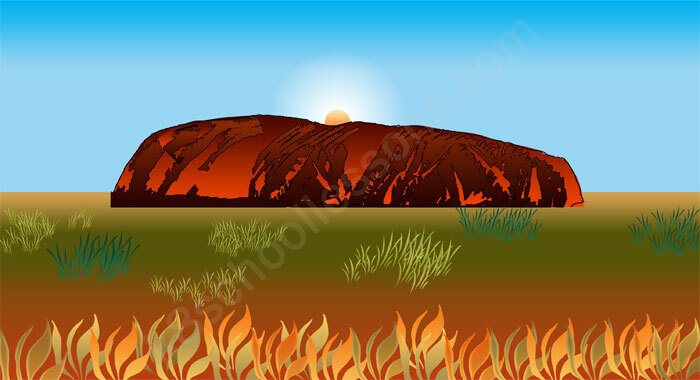 What are the two types of people live in a desert? People who live in permanent houses, and also the Nomads or nomadic peoples. Who are nomads or nomadic peoples? People who live and work on the move from place to place are called nomads or nomadic peoples. Why do nomadic people in deserts often travel at night? It is because, in deserts, it’s so hot during the day. So, desert peoples often travel at night when it is cool, and rest during the daytime. What are the deserts where nomads can be found? What are the nomadic people in these deserts called? Arabian nomadic people are called Bedouins. Why do Bedouins visit oases? What do Bedouins usually eat? They live mainly on camel’s milk, cheese and also dates. What are Bedouins’ tents made from? Bedouins’ tents are made from either goat or camel skins. Why do Bedouins wear long, flowing robes? 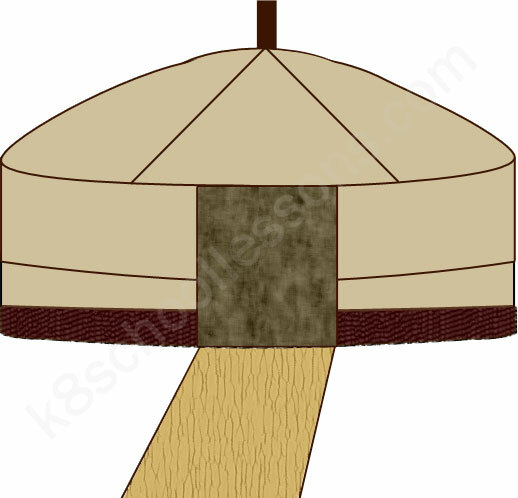 What are Nomadic Mongol tents called? What is the shape of these gers? 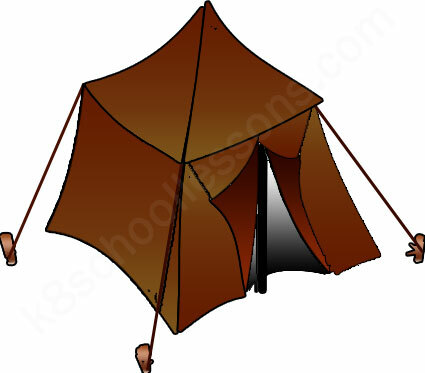 How are these tents made? They are made from thick felt (a type of thick fabric) stretched over a wooden frame. Why do governments encourage the Bedouins and Mongol people to change to a more settled life? This is because to avoid people crossing one country to another illegally. On the other hand, crossing one country to go to another without having permission which is against the law of that particular country. Due to the great heat and in order to avoid it people in deserts have to dress up carefully. What kinds of clothes do people wear in the desert and why do they wear such clothes? What colours are these clothes? People who live in deserts wear light colours, because dark colours attract and absorb heat while light colours reflect heat. What materials are the clothes made of? These clothes are mostly made of either linen or cotton or any breathable fabric. Therefore, these materials allow air to reach the body so as to keep the body cool. What are desert homes made of? Why are so many houses in desert areas painted white? Houses in deserts are painted white, because white reflects heat. So, inside the house is cool. Why do desert houses often have thick walls and small windows? 1) As a result, the heat or sunlight cannot directly and easily enter homes. 2) Since the rain is torrential (very heavy rains), desert houses need to be water proof.